Romas Švedas is a lawyer and has an extensive experience in international economic relations and development of international energy and transport infrastructure projects, corporate governance and work of international organizations, like the EU and UN. R. Švedas has been a civil servant for 20 years and from 2011 an Independent Expert and Lecturer at Institute of International Relations and Political Science of Vilnius University. He is the former Vice-minister of Energy of the Republic of Lithuania, Director of Economic Security Policy Department and Director of Economic Relations Department at the Ministry of Foreign Affairs; former Deputy Permanent Representative (Coreper I) of Lithuania in European Union in Brussels and Counsellor at Lithuanian Permanent Mission to the United Nations Office and other International Organizations in Geneva. Romas Švedas was a member and the Chairman of the Boards of AB Klaipėdos nafta, AB Litgrid, AB Lietuvos dujos, VĮ Ignalinos atominė elektrinė. 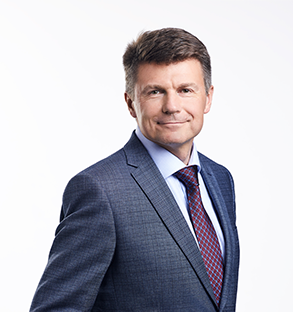 From 2016 Romas Švedas is Chairman of the Board at AB Lietuvos geležinkeliai (independent board member) and from 2014 Romas Švedas is a member and since 2017 the Chairman of the Implementation Committee of UN Espoo Convention. During posting in Brussels he worked closely with the EU coordinator taking part in the early stages of the Rail Baltica project. Being Vice-Minister of Energy, he was in charge of development of power interconnections Lithuania-Sweden (NordBalt) and Lithuania-Poland (LitPolLink), LNG terminal (Independence), shut down and decommissioning of Ignalina Nuclear Power Plant and development of new nuclear power plant in Lithuania, liberalization of power and gas markets in Lithuania while transferring the EU 3rd energy package into Lithuanian legislation. Romas Švedas is graduate of the Professional Board Member (2010) and Chair (2017) education programmes at the Baltic Institute of the Corporate Governance (BICG).